This picture is perfect for today. It is a Van Gogh filled with joy and HOPE. It is bright with color. We know it is of the setting sun only because it is titled so. It could just as well be of the rising sun. 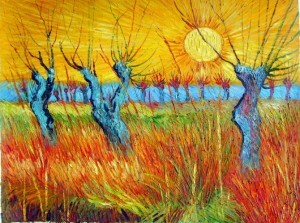 Van Gogh was a troubled painter filled with anxiety and emotion so this painting is particularly special. That he choose to paint willows makes it even more so because willow trees represent magic, healing and inner vision and dreams. 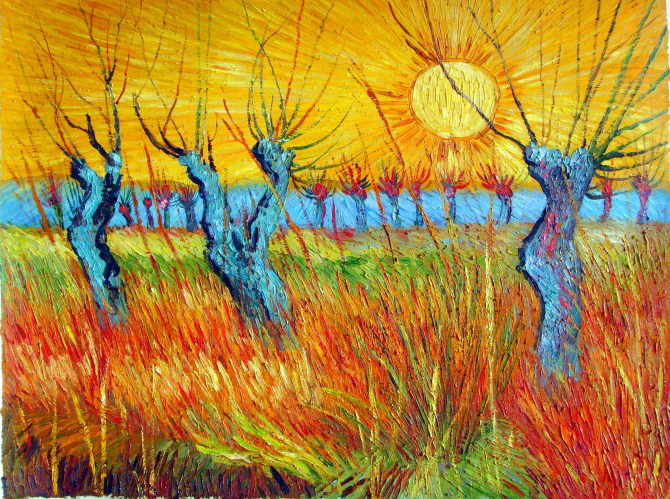 Did Van Gogh know this or feel this? We are asked to reflect on our life. Are we in the hum drums? Are we coasting along? Are we settling? Are we living in color or black and white? Are we frozen? Is our sun rising or setting? (This is not an age question?) We have a choice. We always have a choice. We are asked to reflect on the song not because there is judgement but because maybe we are “frozen on the ladder of my life” and we are just not aware of it. Pause for a moment see the color around you. Absorb it. Feel the light of the sun. Absorb it. Feel your energy recharge. It is a new day full of your HOPE. -Meditate. Focus on your energy. Release all that is negative and breath in positive energy. -If it is too cold to sit or stand outside for a moment, sit in a window and feel the sun. Close your eyes and feel it warm and fill you with its energy. -I worked at our club. Lots of characters. Lots of laughs. -Shannon was able to find a place for vacation. Wahoo. Now I better get moving.